The hero may have fallen, but the cause lives on. 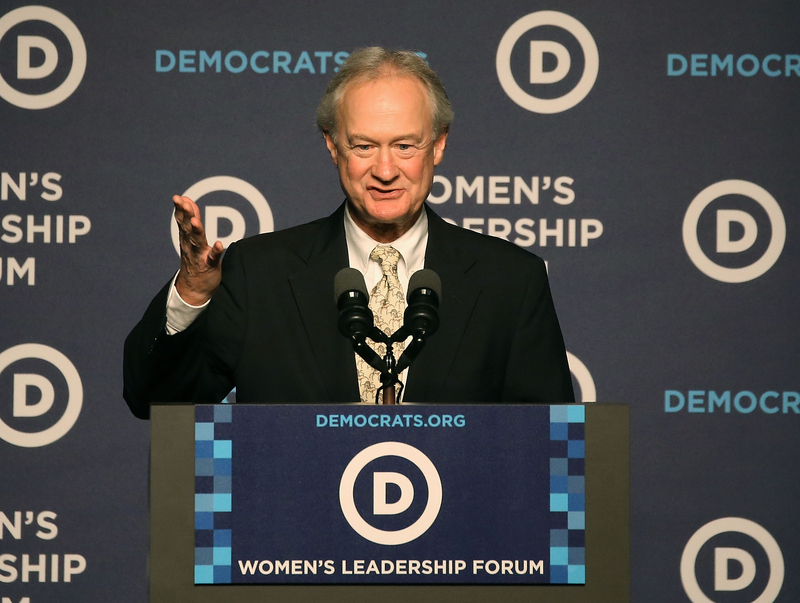 On Friday morning, former Rhode Island governor and presidential candidate Lincoln Chafee withdrew from the Democratic primaries, bringing his briefly, horribly ill-fated experience to an end. This means the race has lost its sole voice on a very particular issue, and it's a real shame — Lincoln Chafee is gone, which means the metric system won't get any more play in 2016. Despite it not ending all that well, you have to give Chafee this much: prior to his entrance into the presidential race, most Americans outside of Rhode Island likely had no idea who he was, and had no clue about any of his policy views. Now, we all know at least one, him being the only candidate in either party to call for the U.S. to adopt the metric system, bringing its systems of measurement in line with the overwhelming majority of the rest of the world. Chafee's presidential announcement ended up garnering some headlines thanks to his metric system position, although it also generated some backlash from anti-metric conservatives. It can sometimes seem like both sides get into surprisingly emotional arguments about it, considering it's such a dry policy question. It's not hard to understand why major, contending candidates wouldn't want to spend any of their time on it, in fairness. In the best case scenario, a politician publicly endorsing the metric system is creating a potentially divisive, emotionally rooted issue that they'd never have been asked about in the first place. In the worst, they could trigger a backlash rooted in nativist and nationalistic attitudes, brimming with hostility for no other reason than the adoption of the world's system. National pride is at stake. The adoption of another country's weights and measures—or in the case of the metric system, the rest of the world's weights and measures—seems an infringement on national sovereignty. That the system in question has a long and distinguished history as a pet project of Francophile, cosmopolitan liberals probably doesn't help make it appealing to American conservatives. Here's the thing, though: if liberals and progressives sound overly chiding about this, it's because we truly are way past time for the metric system. It simply makes far more sense in this day and age for the whole world to use the same basic units of measurement, and even setting aside the fact that it's better-devised and easier to comprehend (although admittedly, relearning your measurements may take a little time and practice to feel familiar again), it's also got the stronger claim on simple ubiquity. If America had acted like a bigger bully about this for the last couple of centuries, of course, maybe things would be different. For decades, our political leaders have pledged to prioritize American interests around the world, and have sometimes used this logic to justify horrible human costs. If some of that more virulent, America-first verve had been used on exporting our system around the world, maybe there'd be a more compelling case to unify the world under it, or even to just leave things the way they are. But America's not the dominant superpower in every respect that it is when it comes to wealth, global influence, and wartime prowess, and this is one of them. At present, only three countries haven't adopted the metric system: Liberia, Myanmar (Burma), and the United States, which makes for a striking trio. Moreover, Myanmar has been actively engaged in its adoption in recent years. In short, there's a real possibility that the U.S. could be standing alone on this someday, and it'd be nice to at least avoid that dubious distinction. If there's any one line to remember from Chafee's campaign, it ought to be this one: "Let's be bold — let's join the rest of the world and go metric."